The Shim`on haTsadiq and Nahalat Shimon quarters in Jerusalem have been much in the news in the past few weeks. They are quite close to the Shepherd's Hotel plot, formerly owned by the Nazi-collaborationist Haj Amin el-Husseini, the British-appointed Mufti of Jerusalem who spent most of the World War 2 years in Nazi Germany and elsewhere in the Nazi-fascist domain. The names of both these quarters refer to Simon the Just, an ancient Jewish high priest believed to have met Alexander of Macedon during his conquest of Israel from the Persian Empire. Here is a photo of a memorial dedication inscribed above the door of the synagogue in the Shim`on haTsadiq Quarter in Jerusalem adjacent to the Sheikh Jarrah neighborhood inhabited by some of the leading Arab families. Poor Jews lived in the Shim`on haTsadiq Quarter [also spelled Shimon haTzadik, etc] near wealthy Arabs, including Husseinis and Nashashibis, up to 29 December 1947, when the Jews fled their homes after attacks by Arab irregular forces under the command of the Husseinis through the Arab Higher Committee. George Antonius, the Arab nationalist propagandist, rented his home on a nearby property called Karm al-Mufti [the Mufti's Vineyard], from the British-appointed Mufti of Jerusalem, a collaborator with the Nazis and instigator of the mass murder of Jews. Note in the photo the Hebrew inscription above the arch above the door. It is hard to read the inscription because of the angle of the shot. However, the last word of the inscription --in the lower left corner-- is clear. It is an acronym in Hebrew תנצבה . This stands for a standard Jewish memorial phrase, quite commonly found on gravestones, although here it is used in the dedication of a synagogue in someone's memory. It means: May his soul be bound up in the bundle of life. For women, the word נפשו [= his soul] is replaced by נפשה [= her soul]. The acronym remains the same in either case. Consecrated to the Lord an offering of . . . This would, I think, have to be followed by the name of the donor and the name of the remembered deceased person. I think I see the name ישעיהו [= Yesha`ayahu = Isaiah]. I think I also see the acronym ז''ל which stands for זכרונו לברכה, meaning "May his memory be for a blessing" [a suitable change is made for a woman]. This acronym ordinarily follows the name of a deceased person. The letters standing for the number of the year on the Hebrew calendar may also be present. 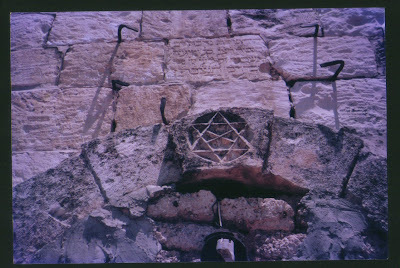 A magen david מגן דוד [= shield of David] is seen below the inscription as part of the arch over the doorway at its crest. Also note five black iron hooks or bent rods around the inscription. Originally there were six such bent rods. Two each on the right and left, and two below. They once held a smooth stone plaque with a secondary memorial inscription carved on it. That is, an inscription in memory of a second person had been placed over the first inscription. This seems to indicate the poverty of these Jews, which we know of in any case. It seems that the community needed money later on and allowed someone to memorialize his departed loved one in return for a contribution or financial support. I saw the secondary inscription on the plaque when I visited the site in 1995. However, by the time that Jews took the synagogue back in the fall of 1998, the overlying plaque had altogether disappeared except for the iron rods or hooks. What provoked the Jewish return was that an Arab living adjacent to the synagogue on the east [about two, three, or four meters away] had begun to destroy the eastern wall of the synagogue in order, apparently, to expand his own home into the small synagogue building, which Arabs had not formerly settled into. Be that as it may, the photo was taken between the summer of 1995 and the fall of 1998. The change in appearance in that time was that the plaque/secondary inscription --already cracked and partly broken off in 1995, had entirely disappeared. The building was restored to use as a synagogue in the fall of 1998 and is still in use. This area of Jerusalem came into the news lately because of strenuous objections by the US State Department, the UK Foreign Office, and the European Union to Jews living in or building homes in what they like to call "East Jerusalem," a part of the city whence Jewish inhabitants were driven out during the Israeli War of Independence [1947-1949] by Arab irregular forces and the Arab Legion of the Kingdom of Jordan [then Transjordan]. These foreign powers do not want a Jewish return to a part of a city that has a meaning in history deriving from its role in Jewish history and religion. Jerusalem has also had a Jewish majority population since 1853, if not earlier. In 1853, the whole population of the city lived in the Old City which is considered part of "East Jerusalem." That is, in 1853, Jews were the majority in East Jerusalem. Had my own experience at CiF. Posted at RL's. EG, my impression of the Guardian and its Orwellian "comment is free" blog is that the paper is mainly an agitprop incident. When they take off a comment for containing the politically wrong facts, then what else can you call it? Of course, it is a stronghold of a new form of Judeophobic bigotry. This time the bigots hide behind a certain political self-righteousness. I would go on that the UK is really the seat of a lot of Israel's problems and the world's problems.